E-devices are so pervasive in our lives that we might not consider the full potential of personal e-waste reduction. The British weighed in with a law that, according to Discover magazine, expands the e-waste definition to include electrical 'adult toys'. Individual manufacturers are also offering green devices. Earth Hour is an initiative sponsored by the World Wildlife Fund and others to raise awareness about global warming by asking individuals, municipalities, and businesses to turn off their lights for one hour (8:30PM local time, 28 Mar). Turning off our personal computers and e-devices appears to be a more complicated issue. Vertatique raised the issue back in 2007 of increased home energy consumption and carbon emissions due to widespread deployment of digital-to-analog (DTA) converter boxes in 2009. Energy Star reports that "In the U.S. alone, depending on viewer behavior and product design, EPA estimates that conventional DTAs could consume more than 3 billion kilowatt hours (kWh) per year and cost Americans $270 million annually in additional electricity bills." New DTA models hold hope for improving the situation. Gaming consoles next target for improved energy consumption? "Consumer electronics is the fastest-growing source of electricity use in people's homes," says the Natural Resources Defense Council (NRDC). "It's now up to 15 or 20 percent." Video game consoles are the latest devices to come under energy use scrutiny. "Today, more than 40 percent of all homes in the United States contain at least one video game console . . .they consumed an estimated 16 billion kilowatt-hours per year -- roughly equal to the annual electricity use of the city of San Diego. Through the incorporation of more user-friendly power management features, we could save approximately 11 billion kWh of electricity per year, cut our nation's electricity bill by more than $1 billion per year, and avoid emissions of more than 7 million tons of CO2 each year." Until the industry steps improves its devices' power management, "gamers can significantly reduce the energy consumed by their consoles through simple steps like turning off the console when not actively playing a game or watching a movie and enabling power management features when available." 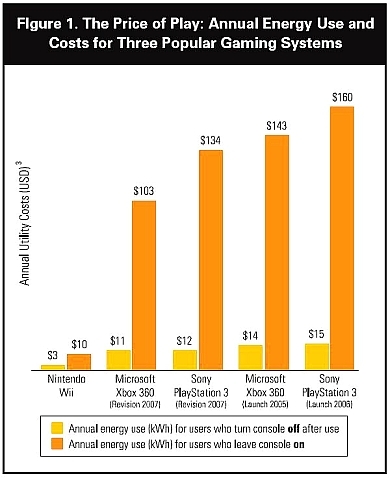 Visit the NRDC's consoles page to read the comprehensive report, Lowering the Cost of Play by Noah Horowitz, and to learn how to enable power management features on existing consoles. Vertatique has been tracking the Climate Savers initiative over the past year and I'm pleased to see its site continue to grow in value. They now offer a robust set of free software applications to help individuals and enterprises tune the power settings of their equipment. I'll report on these tools as I try them out. National Geographic's "High Tech Trash" is loaded with everything from an interactive toxic tour of a computer to an e-waste quiz to stats like ". . . in the U.S. [in 2005], between 1.5 and 1.9 million tons of computers, TVs, VCRs, monitors, cell phones, and other equipment were discarded. If all sources of electronic waste are tallied, it could total 50 million tons a year worldwide . . ." The Photo Gallery tells the story most powerfully - check it out! "With the power of a good-size country, Wal-Mart has put the squeeze on its 60,000 suppliers to reduce their carbon footprint. Starting in 2008, the retailer will use data from suppliers to measure the impact of its entire supply chain. The incentive: Wal-Mart promises better placement in stores for products that have addressed sustainability issues."